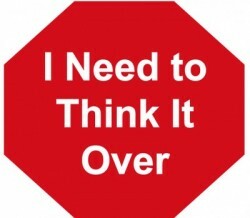 You’ve delivered your presentation, answered all sales objections, asked for the sale and then you hear, “I need to think it over.” For sales reps, this can be very frustrating. While it’s true that sometimes a customer may really need to think it over or get input from others before committing, oftentimes, it is just a delay tactic. Excluding the former, let’s look at some of the possible reasons for the latter and some sales tips as to what you can do to deal with this objection. Thought: Perhaps, you did not ask enough questions or listen to your customer. Sometimes, reps go on “auto-pilot” and spout out all the normal benefits of a product/service, forgetting to tailor the presentation to the specific customer. Make sure that your presentation is customized to each client and includes answers to any possible sales objections within the presentation. If that has been done, it’s possible that the customer is just stalling and using “I need to think it over” or “I want to think it over” as an excuse – as they probably had no real intention of buying. Solution: If you know you have answered all the possible questions/concerns/objections, then put the ball back in the customer’s court by saying, “Seriously, I thought that I answered all your questions. Specifically, what about (the product/service) do you need to think over?” The reason this works is because the sentence begins with a power phrase which contains a hidden assumption that the subconscious mind of the customer will most likely accept as being true. The customer will think, “He did answer my questions.” It also contains a demand hidden as a question (“Specifically, what about the product…”). Thought: Emotions aroused create action. Marketing and advertising use emotions to gain attention and action – so should those in sales. The most common are greed, envy, lust, fear and power. And while price can be an issue, we all know that if a customer really wants to buy something, they can usually find the money to do it. One way to help them along is to find the emotion(s) behind a potential purchase. Solution: Prior to making your call, ask yourself what emotion(s) you could allude to in your presentation. (Notice, I said “allude to.” You never want to blatantly come out and mention them.) Will your product help your customer make more money? (Greed.) Will it help them beat the competition? (Power.) Will it aid him/her in keeping their job? (Fear.) Is your service being used by larger, more impressive companies? (Lust.) You get the picture. Remember, emotions can be incredible motivators to make people buy. Thought: This sounds so elementary, yet I have seen reps make this mistake many times. Occasionally, you do have to work your way past the “gatekeeper.” However, your time is valuable and making that known to the customer is important. Prior to making a call, you need to know if the customer with whom you are speaking is the final decision maker or if that decision be moved to a committee, sent “up the ladder,” made at a later time, etc. Solution: Ask the customer, “Do you have the final authority with regard to purchasing (this product/service)?” If the customer says, “No,” ask who does and if that person can be at the meeting. If he/she can’t be at that meeting, see if you can reschedule. If that is not possible or you’re given some other explanation, you may have just entered the land of “weeding out,” which is located on the island of wasting time. Now, I understand that, sometimes, getting the final decision maker(s) in the room is a challenge and you may have no choice but to “play their game.” Unfortunately, while they are playing the game of “corporate ladder,” you’re playing the old gossip game. (You know, we all stand in a row and I whisper some gossip in your ear, it’s passed from person to person, and by the time the final person gets the info, it’s totally misconstrued.) That’s fun, right? Yes, but not on a sales call. Therefore, if the decision maker can’t be there, your presentation must be altered to provide the messenger with as much information as possible to share that has the least chance of being miscommunicated. Short, informative, yet appealing videos or samples with simple instructions could work. Try and focus on just three points that will help your service/product standout from others, because it is easier for someone to remember a group of three than a bunch of statistics, etc. Obviously, there are always extenuating circumstances that can challenge the aforementioned thoughts and possible solutions, and it’s up to the rep to know when a customer really does need time to think or is just delaying. However, keeping these sales tips, thoughts and solutions in mind may aid you in the future, when you have to deal with the “I need to think it over” sales objection. Entrepreneur expert and funny keynote motivational speaker Bob Garner delivers high content and usable information combined with entertainment in his customized presentations at meetings and events worldwide. ©2014Bob Garner. All Rights Reserved. You may use this article, but you must include my byline and my resource box.